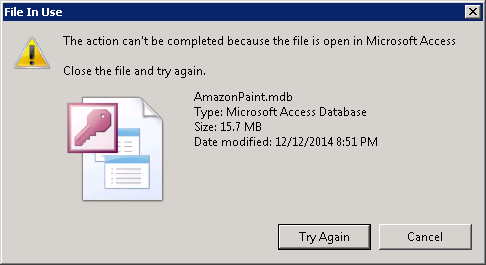 This Error Message Article explains the Windows error message “File In Use The action can’t be completed because the file is open in Microsoft Access…” and details how to fix the underlying problem that caused it to appear. Windows is blocking a change in the file name or location because another application is a accessing it. Close the application that is using the file and try the procedure again. In a multi-user environment, it may be difficult to determine which user on the network is accessing the file. If that is the case, you may need assistant from IT to identify the user(s).